Understanding how large-scale biotas are assembled over time has received relatively little attention due to both theoretical and empirical complexities in dealing with such systems. Amazonia is Earth’s most iconic center of biological diversity and endemism and is arguably the most important terrestrial biome due to its contributions to global systems ecology. Amazonia includes a vast landscape of mostly lowland rainforest found in Brazil, Peru, Colombia, Ecuador, Bolivia, and Venezuela. It harbors the world’s highest species diversity, the largest fresh-water ecosystem in the world, and contributes substantially to shaping the Earth’s atmospheric gasses and consequently its climate. Despite this global importance, we still have a very incomplete picture of how this biodiversity-rich biome developed. At large spatial scales the evolution of a region’s biotic diversity is linked in complex ways to changes in Earth history (tectonics, climate). We can pose several key questions with respect to Amazonia: When was the current Amazonian landscape, in terms of its hydrological system and terra firme forest, established? How was the current species diversity generated and when? Answers to these questions will require seeing Amazonian environmental history as an integrated whole and will call for a multi-disciplinary approach. This talk will report on current thinking about these questions and describe a large collaborative research effort designed to seek a deeper understanding of Amazonian history. 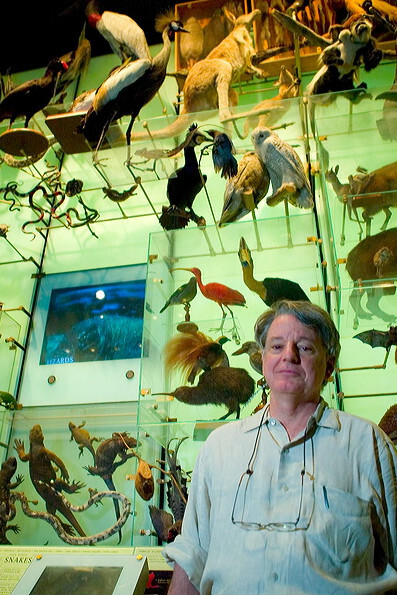 JOEL CRACRAFT is Lamont Curator and Curator-in-Charge of the Department of Ornithology, American Museum of Natural History. He received his B.S. (Zoology) from the University of Oklahoma, M.S. (Zoology) from Louisiana State University, and his Ph.D. (Biology) from Columbia University in 1969. His research interests are in systematic biology, biological diversification, and biogeography. Much of his current research focuses on the higher level systematics of birds and the radiation of the large Australian endemic avifauna, including birds-of-paradise, using both molecular sequence and morphological data. He has written or edited books on phylogenetic systematics (1979, 1980), phylogenetic analysis of molecular data (1991), the biodiversity crisis (2000), the Tree of Life (2004), and the teaching of evolution (2005), in addition to over 180 scientific papers. He is a recipient of the Elliott Coues Award from the American Ornithologists’ Union, and was elected a Fellow of the American Association for the Advancement of Science. He is a member of multiple professional societies and has held office or served on the board of many of them, including being President of the Society of Systematic Biologists and President of the American Institute of Biological Sciences (2004). President John Ingersoll called the 2323rd meeting to order at 8:24 pm on November 1, 2013, in the Powell Auditorium of the Cosmos Club. Mr. Ingersoll announced the order of business. Mr. Ingersoll then presented the evening's speaker as a new member of the Society. Minutes of the 2322nd meeting were read and approved. Mr. Ingersoll then introduced the speaker, Mr. Joel Cracraft, Lamont Curator and Chair of the Division of Vertebrate Zoology, American Museum of Natural of History. Mr. Cracraft spoke on "Amazonia: Reconstructing the History of Earth's Most Diverse biota." Mr. Cracraft introduced the research presented in this lecture as understanding the history of Amazonia during the last 5 or 6 million years. Amazonia covers nine nations and is globally important. Its biomass exceeds a hundred billion tons of carbon, supplying and sinking a large amount. 20% of the atmospheric oxygen and 15 to 20% of global freshwater flows through Amazonia. It is divided into 9 areas of vertebraic endemism which each house multiple species found nowhere else. The questions Mr. Cracraft addressed are: How is this genetic diversity distributed within Amazonia? What is its evolutionary history and how was it influenced by geological changes? How do ecosystems over different scales assemble themselves over time? To answer these questions, we have to look at the influences between continental biota, the regional biota of Amazonia, landscape-scale areas of endemism within, and local communities within those -- all using different spatio-temporal scales. The biogenetic relationships of species within those areas reveal the historical structure. Starting from an ancestral, local biota, when barriers such as mountain ranges or rivers arise, new species can evolve within the separated areas. This is "allopatric speciation," caused by the described "vicariance event." Sometimes barriers disappear and biotas come back together and remix. Also, biotas can have long-distance dispersal across pre-existing barriers. Mr. Cracraft showed diagrams of how such processes can proceed, allowing scientists to reconstruct historical events by speciation patterns replicated within geographical areas. Similar events may have befallen different species during similar time periods, indicating congruent events. We can also geologically investigate barriers appearing and disappearing and correlate this with the evolutionary progression. In Mr. Cracraft's view, the first principle of ecological assembly is that speciation is predominantly allopatric, controlled by barriers and isolation. These barriers are a function of earth's history and geomorphology. Both vicariance and long distance dispersal can create allopatry and speciation, but vicariance leaves historical traces that we can use to reconstruct the region's history using phylogenetic analysis. Speaking as a systematist, Mr. Cracraft expressed the need to understand environmental history, spatial history, ecological history and species history. This involves studying what species are there and what their phylogenetic relationships are. Afterwards, the scientist would try to estimate a time-tree, reveal the historical spatial pattern, and figure out the paleoenvironmental history. All of this requires interdisciplinary work with biology and geology, with better integration across disciplines, especially for Amazonian history because of its complexity. Currently, 17 institutions in Brazil, Argentina, Great Britain, Canada and the US form a broad scale collaboration to study the complex problem of characterizing Amazonian biodiversity. The study hinges on geographically referencing species and studying diversity and endemism patterns with these references. Using birds, plants and primates, the collaboration amasses and uses big databases of abiotic and biotic variables across the region to look at the history of Amazonian taxonomic diversity. The teams include climatologists and geologists as well as biological scientists and other specialties. Mr. Cracraft then presented the trumpeter bird as a case study in this research program. They are endemic in different Amazonian areas, nonrandomly distributed with different evolutionary taxa in each of these areas, and friendly to humans. Mr. Cracraft reported the construction of a phylogenetic tree that links sister species of trumpeter birds to areas of endemism, giving a perspective of Amazonian paleogeography with north/south as well as east/west patterns. The dating of this phylogeny can be estimated by using fresh tissue and fossil records. This diversification happened in just 3 million years. We observe more genetic diversity in the east, implying that the eastern species have been around longer. Another historical hypothesis is that the north and south populations both started in the east and moved west. This study can be used to construct hypotheses not only on the biological history, but on the relative ages of the river systems, that is to say, geological history of the region as well. Mr. Cracraft described how the project scientists created a model based upon these data. Starting from separate Pliocene wetlands in the east and west, geographic events such as the western wetland draining into the east around 2.7 million years ago, and new rivers arising and splitting areas of endemism at different points since then, can be traced and correlated with the history of new species arising. 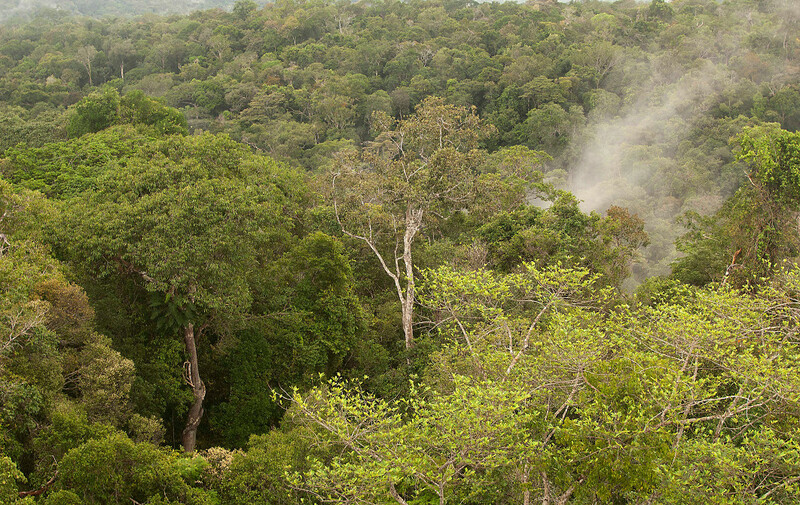 This narrative, which shows that the present form of the Amazon is a young river system, is supported by geological data which is consistent with the phylogenetic data. The river systems can change very rapidly, driving vicariance and allopatric speciation. We can also look at genetic structuring. In one endemic area there is high level of genetic structuring, implying a more stable environment, in contrast to other areas with very little structure. It is possible to reconstruct the environmental histories of local areas of endemism by inverse vegetation climate modeling, by finding the required climate parameters to explain the observed differentiation. In conclusion, Mr. Cracraft pointed out that strong integration across disciplines is required to drive research into really complex questions about evaluating the history of Amazonian biodiversity. Mr. Ingersoll then invited questions from the audience. One question was on how a river could be a barrier for birds, which fly. Mr. Cracraft stated that in fact, most birds do not fly all over the place; they prefer not to cross or may not be able to cross rivers. Observed behavior of birds is that certain species can be very narrowly endemic. Thus the rapidly changing river systems in Amazonia can create barriers and break populations, leading to speciation. Another member of the audience wanted to know more about the correlations of these studies with data from other species. Mr. Cracraft explained that the program is currently looking at all the groups of birds and primates across Amazonia. Furthermore, two groups of butterflies and two major families of trees are being studied. These different groups don't necessarily all have the same areas of endemism and the same history, allowing the program to layer the history. They also hope further collaborations will arise. Mr Ingersoll thanked the speaker and made the usual housekeeping announcements. At 9:58 pm, President John Ingersoll adjourned the 2,323rd meeting to the social hour.